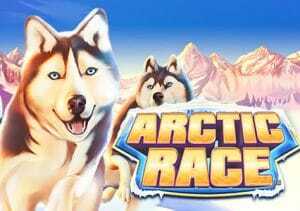 Siberian Husky racing is the unusual theme on offer in Arctic Race. Created by Novomatic, it’s a typically simple 5 reel, 243 ways to win video slot. There’s only 1 bonus feature but it has the potential to be a good one. On offer are 3 free spins where the reels feature just scatters with cash values attached. Play on your PC, tablet or mobile devices from between 25p and £100 per spin. The set up in Arctic Race is very straightforward. With a snowy scene in the background you’ll see A to 9 symbols alongside a log fire, husky sled and a mountain. The best symbol is the Arctic racer himself, clad in goggles and ski jacket. Land 3, 4 or 5 of him on adjacent reels and you’ll pocket an award equal to 4, 20 or 80 times your total bet. Helping your winning chances is the pack of huskies symbol. This wild can hit on reels 2, 3 and 4 only. It doesn’t offer any pays in its own right but it does replace everything apart from the trophy which is the game’s scatter. Arctic Race comes with a Trophy Respin feature – to activate it, you’ll need to land the trophy scatter on reels 1, 3 and 5 on the same spin. Your reward is 3 free spins. Not the biggest haul we grant you. These free spins offer some pretty good potential though. The reels during the free spins are made up of blanks and trophies only. Each trophy comes with an associated cash prize, up to 100 times your bet, which is awarded whenever it hits. Each scatter that lands also resets the number of free spins back to 3. Arctic Race is a simple game. That’s true of the design (the visuals are typical Novomatic but the guitar-heavy backing track seems a bit out of kilter) and the gameplay. The Trophy Respin feature is basic but does the job rather well. This isn’t one of Novomatic’s more volatile games. The variance is in the medium range but you can win 2,000 times your bet on every spin/free spin. We don’t expect much in the way of innovation when it comes to Novomatic video slots. You won’t find anything particularly fresh here. Arctic Race does offer the usual blend of straightforward design and gameplay. They combine to create a typically playable game. If you’ve enjoyed other games from the Novomatic catalogue, you should find plenty to like in this wintry adventure. Alternatively, I recommend you try From Dusk Till Dawn and the superb Eye of the Dragon.